Kong of Skull Island - A Review - Comics Are Go! 2) It’s the best giant monster fighting yet in the digital era of movie monster entertainment. Kong of Skull Island is a classic genre mash-up. The mixture of War Movie with Giant Monster Movie mostly works. If a Kong movie was already on the agenda, it was probably very easy to pitch this movie to the studio. It’s 1973 and the Vietnam War has just ended. In Washington, several scientists convince government muckety-mucks to finance an expedition to a recently discovered island. The island has been inaccessible…and mysterious. The military, having little else to do other than listen to Jefferson Airplane and Creedence over and over again, sends a large team of soldiers along with them. Their Apocalypse Now helicopter squad is complete with motivational music being played through giant speakers. The only thing they don’t do is come in low out of the rising sun. They do, however, blow a lot of stuff up. This turns out to be not such a great idea. The movie is pretty much what you would expect from a Kong movie without the part where they actually leave the island. It’s more a Kaiju-style movie than a King Kong movie. 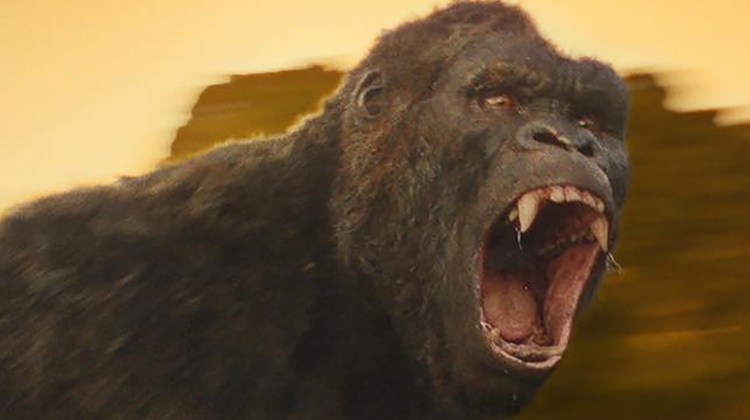 Kong is a massive creature, far bigger than he’s ever been portrayed before. Think Godzilla size. The evil nasties are effectively evil, the native inhabitants of the island are effectively idyllic and unblemished, the military is effectively misguided, the scientists are effectively cowardly and the environmental warriors are effectively concerned. There is an effective diversity of classic character types and they interact in an effectively predictable way. Nearly every genre trope is represented here – all of them, for the most part, effectively. The top-heavy cast, which includes Tom Hiddleston, Samuel L. Jackson and John Goodman, does everything it can to keep the movie from being just one Giant Monster fight after another. For the most part, they fail. Much of what they do is portray archetypes of their respective characters. Goodman is the obsessed scientist, Jackson is the gung-ho military guy, actress Brie Larson is the tough-as-nails anti-war photojournalist cutie, Hiddleston is the extraordinarily gifted and wise tracker, and on and on. Side Note: Am I the only person who wouldn’t bother ever wasting time creating a character for Samuel L. Jackson when every single part he plays simply becomes Samuel L Jackson? I feel the same way about Tommy Lee Jones. Characters merge and clash throughout the film in mostly predictable ways, sometimes absurdly so. It’s the special effects and the mashup of genres that works best here. The monster fights are realistic and logical in their movement and their effect on the surrounding environment. Although the genres represented, like the characters, follow predictable patterns, the interweaving of them is handled well. Director Jordan Vogt-Roberts clearly understands the Giant Monster Movie. His sense of how to present giant creatures in all their massive battle-raging glory demonstrates a satisfactory acknowledgment of what every fan of this genre has been craving for centuries – more of the monster. It is a characteristic of the genre to do a slow reveal of the beast. The pattern is often giant footprints, then giant harmless creatures, then giant harmful creatures, then tantalizing peeks at the giant hero monster, a foot here, and hand there, then the big reveal and the final 15-minute fight scene. This sequence of events is endemic of nearly every monster movie since filmmakers (really Roger Corman) gave birth to the genre in the early 1950s. These films never had huge budgets so the slow reveal was more of a side effect of limited cash than actual plot device. With the digital effects and mega budgets of today’s action films, there doesn’t seem to be a reason to waste a bunch of time with the slow reveal, yet it seems to always continue. The 2014 American production of Godzilla was the perfect example. By avoiding big reveals of the monster so long, genre fans were largely disappointed with everything but the final 15 minutes of the film. Vogt-Roberts doesn’t wait for the slow reveal. After the plodding 25 minute “origin story” (everything that happens up to their arrival on the mountain – the boring stuff), Kong pretty much appears almost immediately in his full glory. This delighted the Giant Monster fan in me to no end. I hate the slow reveals. Give me the monster and let’s see him fight stuff. We do get the obligatory “Oh my gosh, He’s been beaten” scene and the “He’s just misunderstood” scene, but none of this spoils the fun of watching a bunch of giant creatures beat the living crap out of each other. There’s plenty of that. If that’s your thing, you are going to be very happy. By the way, definitely stay through the credits. I always like Monster Movie.